Growing up witnessing poverty, hunger and brutality on women and children, Jaya Devi knew her future will be no different. Due to the militant’s threat, she was being forced to stop her education while she was in the sixth standard. And finally she was married off at the age of 12. Her first child was born when she was only 16. Instead of having sweet memories of childhood, Jaya Devi had only bitter memories from her childhood. But, all these could not deter her spirit to bring changes to her community. I want to educate all the children, especially girls, stop child marriage, and more than anything, I want to provide safety to the villagers. We have been living in threat our entire lives due to the Naxalites. We need the support of people and the government to fight this. Jaya Devi started self-help groups in the Karaili village to serve the marginalized community, especially women to become financially independent and avoid money lenders. She then turned her concern towards the environment. Jaya Devi started addressing the issues such as water conservation and tree planting. Jaya Devi learned various methods of rain water harvesting from Kishore Jaiswal, a social worker from her nearby village. She then brought all the villagers together and constructed a tank to catch the rain water. Soon, her efforts brought good results in the well irrigated fields. What makes me proud to be a woman is that I don’t need a man to take care of me – I am self-reliant and have helped other women achieve the same. Today, every woman should work towards improving her status in the society and they need to know that by demanding equal status they are just practicing their right. Jaya Devi has risked her own life while protecting the tribal villagers of Munger from the Naxal attack. Through tree plantations, water harvesting and community participation she has brought about a green revolution in the Munger district. 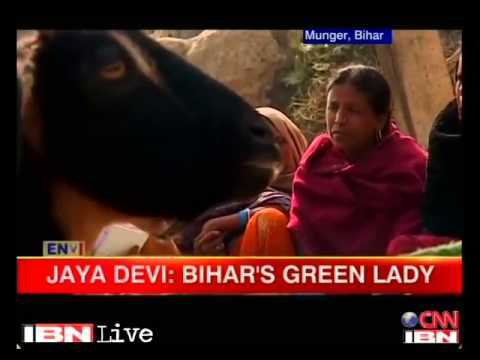 This brave lady is popularly known as the green lady of Bihar. Jaya Devi has received many awards and recognition for her enormous contribution. No one can stop any individual or any community from bringing changes for the betterment, if everyone has a mindset like Jaya Devi. Shocking facts: What happens if a top predator species vanishes from our ecosystem?